The pub reopened a year ago after being taken over by Black Country Ales, and was also CAMRA’s Pub of the Season for summer 2018. The award was presented during a “tap takeover” event with guest ales from the Fixed Wheel brewery and cheese tasting with Fowlers of Earlswood. 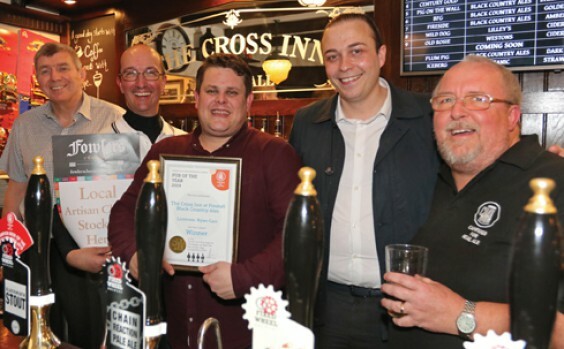 Above: Licensee Ryan Carr (centre) with Angus McMeeking (director of Black Country Ales), Adrian Fowler (owner of Fowlers of Earlswood), Black Country Ales area manager Anthony Walker, and CAMRA branch chairman Gez Quinn.